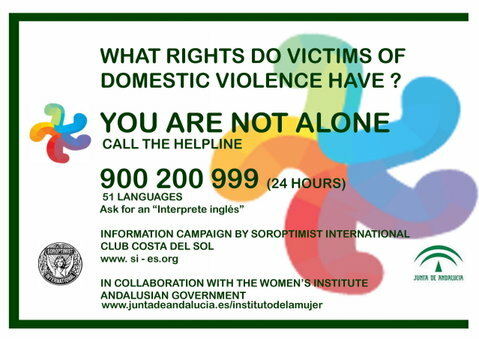 The British Consulate in Malaga, working with the Ayuntamiento de Mijas and Costa Women, has held an event to raise awareness on the issue of domestic violence amongst British nationals in Andalucia. Vice-Consul Rosslyn Crotty said “Our primary focus is to help the vulnerable; with the large number of the arrests we receive relating to domestic violence, we need to let British nationals know that this is a real concern and we want to advise them where to go to seek help”. Amongst the speakers were the National Police, Guardia Civil, The Soroptmists International, SAVA (Servicio de Asistencia a la Victima en Andalucia), and the Centro de Mujer & Social Services. The event was held on the 29th May at the CIO Mijas (Centro Andaluz de Formación Integral de las Industrias del Ocio). The aim of the event was to promote a life without violence. Each speaker touched on different points. The Soroptimists International is a worldwide organisation focusing on women’s issues that was keen to highlight the 24hour helpline – 900 200 999 – that offers information in 51 languages relating to the rights of victims of domestic violence. The organisation encourages victims to use the hotline and to pass on the campaign message “You are not alone”. Encarna Daunis, a lawyer and representative from the Centro de Mujer & Social Services, stressed the importance of including as much information as possible when making a ‘denuncia’, or official complaint, to the police. She asked victims to take their time when making the police report and to include specific details about their situation including their living conditions as well as their mistreatment. 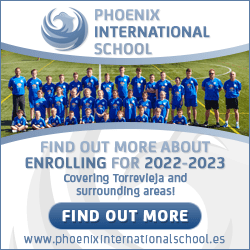 Both the National Police and the Guardia Civil operate an electronic tag system similar to that in the UK, allowing the police to keep track of offenders with restraining orders in place. The police forces said they work closely together to protect victims of domestic violence, and operate a sophisticated program in order to assess each case of domestic violence and its level of danger. Some 400 electronic tags are in operation for offenders of gender or domestic violence, with 26 of the bracelets being used in the Malaga province. SAVA explained the help available to victims and how they provide psychological assistance and legal guidance, and can accompany victims during police, judicial and medical proceedings. Ali Meehan from Costa Women, a social and business network, wanted to remind victims that there is a network of support available and they do not have to live a life of violence. If you or anyone you know needs assistance relating to domestic or gender violence, call 900 200 999, 016 where English speaking support is available.